Coming Thursday, October 24, a new theme enhancement will transform your website to work seamlessly on smaller mobile devices. 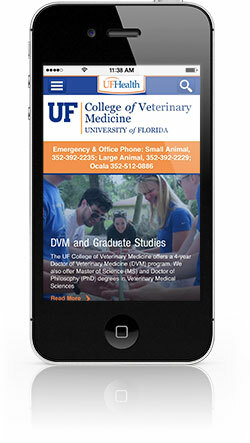 Almost 20% of traffic to UF Health websites comes from mobile devices, and this amount is rapidly increasing. 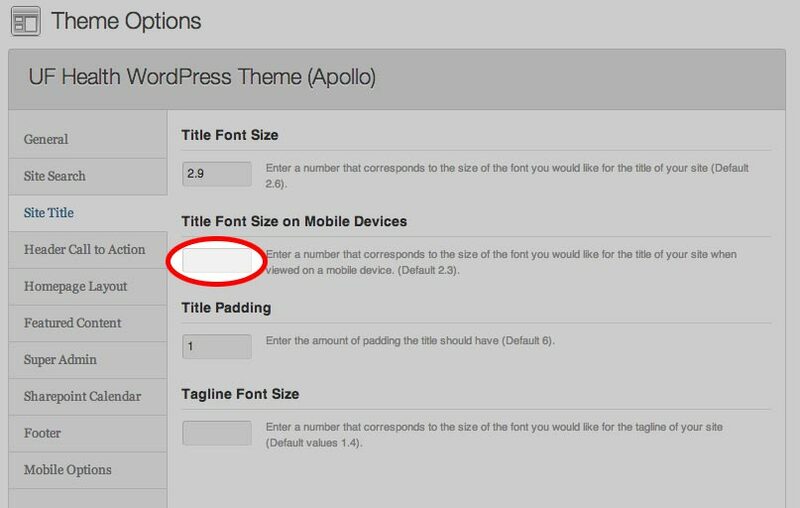 As more of our audience moves to using the web on their handheld devices, it became a priority for us to re-conceptualize the Apollo theme to be responsive – that is, the site changes its flow and structure to accommodate the size of the screen being used to view the site. 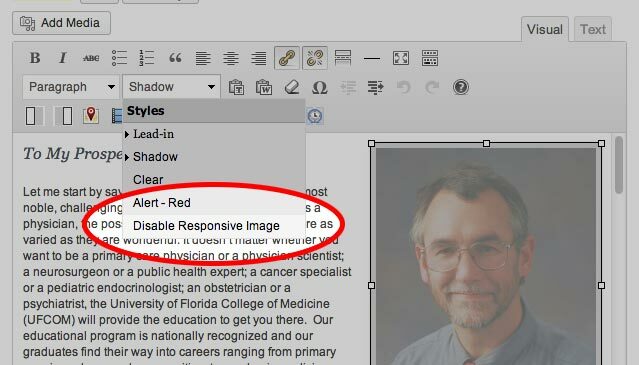 or on an image-by-image basis in the WYSIWYG editor — simply select the image you DON’T want resized, and select the ‘Disable Responsive Image’ style. The image will then be left alone. You can turn off responsiveness on a per image basis in the editor. A new mobile-only slider appears on tablets and smart phones, consolidating both the ‘Story Stacker’ and traditional slider into one. The mobile slider is a more compact way to efficiently deliver your content in a mobile friendly manner. Note: in some rare cases, you might be using what we call a ‘full width image’ with captions disabled for your slider. These are normally images with text embedded in the image (for example, a banner or graphic made in something like Photoshop). If your slider uses these styles of images, you will want to use the new ‘Mobile Slider Image’ box, which is located below the Featured Image box. Apollo will load the appropriate image for the users’ screen size. The sidebar navigation that appeared on many internal pages will now be accessible via the fly-out menu. Header links and social media icons that appear above the search on a full width site also move to the fly-out menu to the left. If you have activated user-role based navigation in your Apollo theme, this will convert to an accordion style navigation in order to conserve screen space and make a more efficient mobile experience. If you need to embed video, we strongly recommend using YouTube — it’s the best global solution. Contact Web Services to get more information about YouTube access. 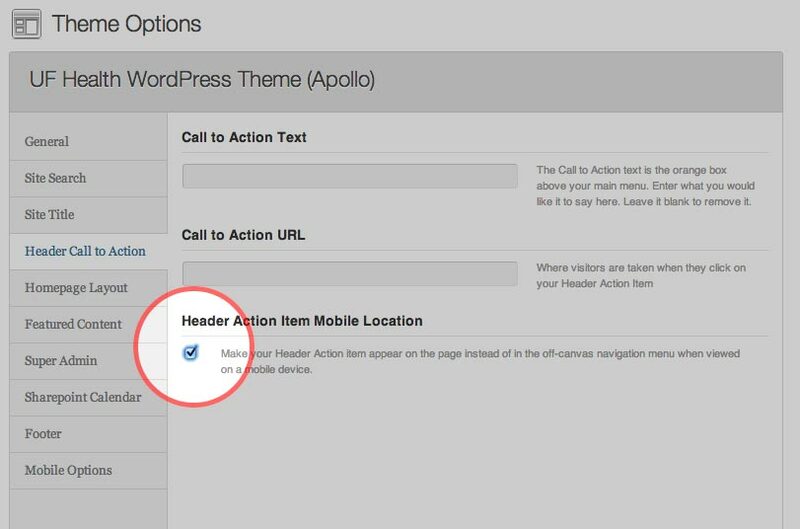 Note: You can change it’s position by visiting the ‘Header Call to Action’ portion of your theme options. Tables now scroll horizontally on mobile devices if they are too wide to fit otherwise. Just swipe the tables with your finger to see the rest of the data. 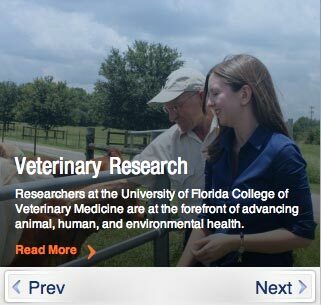 Have any questions about the responsive theme or need help in adjusting or modifying some of the content for view on a smartphone? Web Services is here for you. Please contact us and we’ll be happy to assist.